Red and green are the two primary colours that Christmas is normally associated with. For obvious reasons we see mostly green Christmas trees around. Have you ever seen one that is all red? This tall tree sprouts leaves in a bright shade of orange-red. What an attractive sight! You would find this fiery tree at Orchard Central, one of the newly-opened shopping malls along Orchard Road. The decorations are simple – shiny baubles in shades of orange, plum and magenta. The colour combination is nice and vivid. A tree in such an unusual shade of colour is certainly memorable. Not bad for a newcomer that wants to create an impression! I always appreciate unique trees. Some of my favourites include the pink tree that Cathay did in ’06 and ’07, and West Coast Plaza’s blue tree last Christmas. 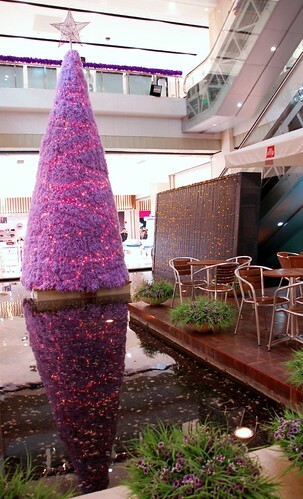 Then there’s the purple tree spotted in China that is made with feathers. For more Christmas trees, check out the Sparklette Christmas Tree of the Day series. The tree looks gorgeous! I passed by Orchard Central the other day but I didn’t realise it has opened already. I was on my way to 313 Somerset. Did you see the tree there? It’s metallic! Yes, I saw the tree at 313 Somerset. It’s one unique little guy! Silver and purple with metal plates all over! I have some pictures but they aren’t well-taken, what with the hundreds of other people in the background. Yeah I know. It’s like half of the Singapore is in Orchard Rd every weekend.